Aims: The c-kit D816V activating mutation is found in >80% of cases of systemic mastocytosis (SM) and represents a potential drug target. Furthermore, because D816V is one of the diagnostic criteria for SM, it is clinically relevant to determine whether the mutation is present. Traditional techniques such as DNA sequencing are often not sensitive enough to detect mutations in low-abundance tumour cells, including SM. Here, an allele-specific assay to detect the D816V mutation in DNA from archived formalin-fixed paraffin-embedded tissues is described. Methods: A two-tube PCR format was employed to amplify c-kit exon 17 as a control and an allele-specific reaction to selectively amplify the D816V mutant allele using standard oligonucleotides. A D816V-mutant plasmid control was generated by site-directed mutagenesis of wild-type cells. 14 cases of SM, one D816V-positive seminoma sample, and 35 cases without SM were analysed using the assay. Results: The assay successfully amplified D816V in the mutant plasmid control, 13/14 cases of SM, and confirmed D816V in a seminoma sample. In addition, D816V was not amplified in 35/35 cases without SM. Serial dilution experiments demonstrated sensitivity down to <1%. Conclusion: A sensitive, specific and cost-effective assay to detect the D816V mutation in archived formalin-fixed paraffin-embedded tissues from cases of SM has been developed. KIT is expressed on mast cells (MCs), interstitial cells of Cajal, germ cells, melanocytes, and is necessary for normal hematopoiesis.10 Activating mutations in the c-kit gene have been observed in human neoplasms that share lineage relationships with normal KIT expressing cells. These tumours include gastrointestinal stromal tumours,11 seminomas,12 melanomas,13 and acute myeloid leukaemias.14 In SM, the activating D816V mutation is found in >90% of adult cases2 15 16 and is one of the minor diagnostic criteria. Therapeutic options for the treatment of aggressive SM have relied upon cytoreductive agents, including interferon α and cladribine,17 yet responses to this class of drugs have been marginal. Tyrosine kinase inhibitors such as imatinib have been used to treat GIST patients with different c-kit mutations. However, D816V-mutant c-kit has been shown to inhibit the function of imatinib in vitro.18 19 Reports of newer drugs suggest that Dasatinib, a dual SRC/ABL kinase inhibitor may be effective at inhibiting kinase activity of D816V-mutant c-kit17 20–22; thus detection of D816V may help to direct therapy. Currently, methodologies to detect the D816V mutation must utilise sensitive strategies that can detect the mutation in as little as 1% of the total cell population because MCs are frequently admixed with non-neoplastic cellular elements. Consequently, direct DNA sequencing and denaturing high-performance liquid chromatography (dHPLC) are precluded from routine D816V analyses.23 Reported strategies to detect the D816V mutation include peptide nucleic acid (PNA) enrichment of the mutant allele followed by melting curve analysis, but this requires expensive hybridisation probes and careful titration of the PNA oligomers to target for optimal results.24 Other studies have utilised PCR amplification followed by restriction enzyme digestion to selectively target the D816V mutation,16 25 but the additional cost of enzymes and overnight digestion may prove inhibitory. Allele-specific PCR (AS-PCR) amplification using modified oligonucleotides has been reported,23 25 yet modified oligonucleotides also add to testing costs. Here, we describe an AS-PCR assay using standard, unmodified oligonucleotides to selectively amplify the D816V mutation in SM from archived formalin-fixed paraffin-embedded (FFPE) tissue samples. We were able to detect the D816V mutation in 13/14 cases of SM and one case of seminoma, all of which were below detectable limits of DNA sequencing. Specificity studies illustrate that 35/35 FFPE patient samples without SM were D816V negative. We were able to confirm the presence of the D816V mutation in one patient sample by cloning into a vector and sequencing colonies. Finally, sensitivity studies demonstrated detectable limits of <1% mutant in a background of wild-type DNA. The results of our studies demonstrate a simple, sensitive, and specific assay for the detection of the D816V mutation and should prove useful in the evaluation of patients with SM. Fetal bovine serum (FBS), antibiotic/antimycotic solution, Luria–Bertani (LB) agar, kanamycin, and pENTR vector were obtained from Invitrogen (Carlsbad, California, USA). The Puregene DNA Isolation kit was obtained from Gentra (Minneapolis, Minnesota, USA). dNTPs containing dUTP were obtained from Applied Biosystems (Foster City, California, USA). Heat-labile uracil N-glycosylase and FastStart DNA polymerase were obtained from Roche Diagnostics Corporation (Indianapolis, Indiana, USA). PCR purification kits were obtained from Qiagen (Valencia, California, USA). Hemo-De deparaffinising reagent was obtained from PMP Medical Industries (Irving, Texas, USA). The enzymes NotI, AscI, T4 DNA ligase, and calf intestinal alkaline phosphatase (CIP) were from New England Biolabs (Ipswich, Massachusetts, USA). PFU polymerase and QuikChange II site-directed mutagenesis kit were obtained from Stratagene (La Jolla, California, USA). Oligonucleotide primers were synthesised by Integrated DNA Technologies (Coralville, Iowa, USA). Ethidium-bromide-stained agarose gels were obtained from Cambrex (East Rutherford, New Jersey, USA). Exosap-IT was obtained from USB (Cleveland, Ohio, USA). All other chemicals were of the highest commercial quality. FFPE tissue samples were obtained from the surgical pathology archives at the University of Utah Health Sciences Center. Samples ranged from 2% to 15% tumour cells. The use of human tissue for this work was approved by the Institutional Review Board at the University of Utah (no. 11903). The human Eol-1 cell line, which expresses the FIP1L1-PDGFR rearrangement but is wild-type for c-kit, was obtained from Dr Jerry Gleich (University of Utah Health Sciences Center). Genomic DNA was isolated from FFPE tissue samples and cell line following the manufacturer’s protocol. Briefly, tissues were deparaffanised in Hemo-De. Cells from the Eol-1 cell line and deparaffinised tissues were lysed and treated with proteinase K followed by RNase A. Protein was precipitated and DNA pellets rehydrated. Concentration and purity of DNA was assessed by absorbance at 260 and 280 nm. The forward primer from set 1 (see table 1 for sequences) spans the c-kit intron 16/exon 17 boundary and the reverse primer recognises intronic sequences flanking exon 17 and they result in a 184 base pair (bp) amplicon for both the wild-type and the D816V mutant. The use of this primer set serves as a control to insure that genomic sequences for c-kit exon 17 are present in samples to be analysed. Primer set 2 consists of the same reverse primer as in set 1, but the forward primer was specifically designed to only recognise the D816V mutant sequence. The D816 mutation is the result of an A-to-T transversion. Therefore the forward primer for primer set 2 was initially designed with a T at the 3′ end rather than the wild-type A (bold T). An additional mutation was added to the forward oligonucleotide 3 bp from the 3′ end in order to improve specificity (italic C). This primer set is used to specifically amplify the mutant allele, and results in a 90 bp product when the mutation is present. Primer sets 3–5 were used to generate artificial plasmid templates. In this regard, primer set 3 was designed with a NotI recognition site in the forward primer (italic) and an AscI recognition site in the reverse primer (italic). This primer set was used to amplify c-kit exon 17 sequences from genomic DNA isolated from Eol-1 cells prior to cloning into the pENTR vector (see below). Amplification with this primer set yields a 1055 bp amplicon. Primer set 4 was designed with a NotI recognition site in the forward primer (italic) and an ASCI recognition site in the reverse primer (italic). This primer set was used to amplify c-kit exon 17 sequences from genomic DNA isolated from a FFPE D816V-positive patient sample prior to cloning into the pENTR vector (see below). Amplification with this primer set yields a 205 bp amplicon. Primer set 5 contains c-kit exon 17 primers which have been constructed to amplify the D816V mutation. They contain the A-to-T transition so that amplification with this primer set will yield DNA coding for the D816V mutation (bold and underlined T (forward) and A (reverse)). They are used for site directed mutagenesis as described below. Genomic DNA was isolated from the Eol-1 cell line and c-kit exon 17 amplified with primer set 3 as indicated in table 1. Genomic DNA isolated from a paraffin-embedded bone marrow core biopsy from a D816V-positive patient was amplified with primer set 4 (table 1). Reactions were performed with a 96-well GeneAmp PCR System 9700 thermocycler (Applied Biosystems) with an initial heating at 95°C for 2 min, followed by 30 cycles consisting of denaturation at 95°C for 30 s, annealing at 65°C for 20 s, and elongation at 72°C for 65 s. The products were analysed on 1% ethidium-bromide-stained agarose gels and the identification of the expected 1055 bp product from the cell line and 206 bp product from D816V-positive patient indicated the successful amplification of c-kit from respective samples. The c-kit amplicons and the pENTR vector were digested with NotI followed by AscI. The digested pENTR vector was subsequently treated with 5 U CIP and analysed by gel electrophoresis on 1% ethidium bromide-stained agarose gels. The c-kit inserts were ligated to the pENTR vector using T4 DNA ligase overnight. Ligations were run on a 1% ethidium-bromide-stained agarose gels and the presence of a 3.6 kb band from the cell line and 2.8 kb band from the D816V-positive patient indicated successful ligation. The Escherichia coli strain XL1-Blue was transformed with the ligation mixture by standard techniques and the transformants selected by plating on LB plates containing kanamycin (1 μg/ml). The efficiency of transformation was about 90%. Primers containing the D816V mutation (table 1, set 5) were used to introduce the mutation into the pENTR- c-kit plasmid from Eol-1 genomic DNA using the QuikChange II site-directed mutagenesis kit, following manufacturer’s protocol. Briefly, after amplification of the mutated plasmid, the DNA was digested with Dpn1 and transformed into E coli XL1-Blue Supercompetent cells. Transformants were selected on LB plates containing kanamycin (1 μg/ml). The efficiency of transformation was 85%. Mutated plasmid DNA was isolated from several transformants and sequenced to confirm the presence of the D816V mutation. The plasmid carrying the D816V mutation is referred to as JS1. Wild-type c-kit from Eol-1 genomic DNA cloned into pENTR served as a negative control, and is referred to as JS2. PCR was performed with a 96-well GeneAmp PCR System 9700 (Applied Biosystems). Reactions were performed in a final volume of 20 μl and contained 0.2 U FastStart polymerase, 2 mM MgCl2, dNTPs (2.5 μM dATP, 2.5 μM dGTP, 2.5 μM dCTP, and 5 μM dUTP), 0.2 μM primers, and 0.1 U UNG. After heating at 37°C for 2 min and then 95°C for 5 min, cycling conditions included a denaturation step at 95°C for 20 s, an annealing step at 58°C for 20 s and then an elongation step at 72°C for 20 s. Thirty-six cycles were performed, and the final elongation step was for 7 min. The reactions were then brought to 4°C prior to gel electrophoresis. Results of the PCR were analysed by running the products on 4% ethidium-bromide-stained agarose gels at 100 V for 1 h with running buffer (0.05 M Tris pH 8.0, 0.05 M boric acid and 1 mM EDTA, with 1 g/dl ethidium bromide). After electrophoresis, the gels were photographed with a gel documentation system (BioRad, Hercules, California, USA). Following PCR amplification, all cloned products and D816V-positive amplicons were treated with Exosap-IT following the manufacturer’s recommendations and further submitted to bidirectional sequencing using the BigDye Terminator V1.1 cycle sequencing kit. Sequencing was performed in the ABI PRISM 3100 genetic analyser. Data was aligned to Genbank’s human c-kit sequence (U63834) using SeqScape V2.1 (ABI). The D816V AS-PCR requires two independent amplifications (see fig 1). The first PCR uses primers that flank c-kit exon 17, resulting in a 184 bp product. 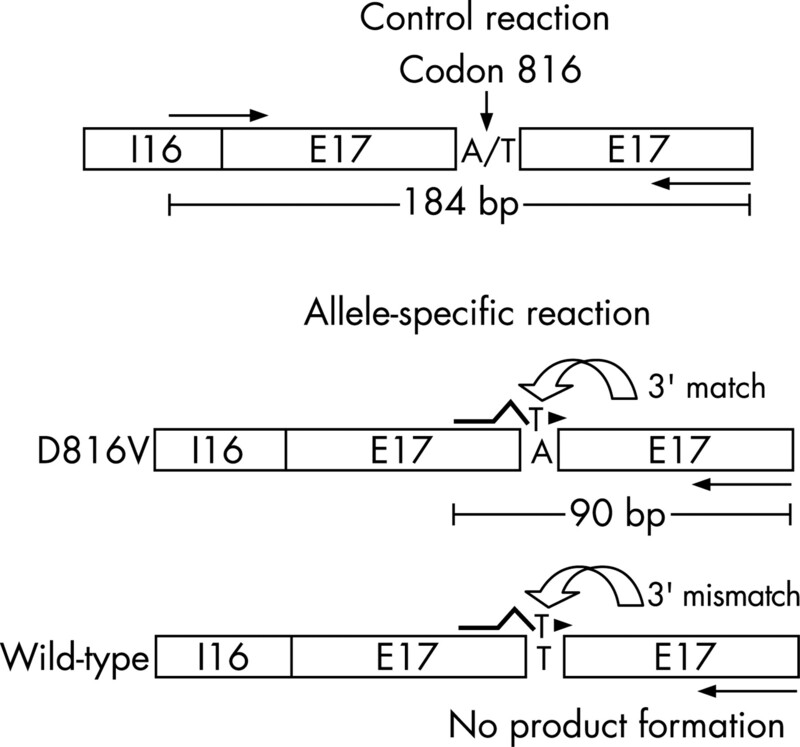 This reaction does not distinguish between the wild-type and the D816V mutation and serves as a control to ensure that c-kit exon 17 sequences, where the mutation is located, are amplifiable in the sample to be tested. The second PCR reaction uses the same reverse primer as the control reaction, but the forward primer was designed to recognise specifically the A-to-T transversion characteristic of the D816V mutation (see table 1). The use of this PCR results in a 90 bp amplicon only if the mutation is present in the sample. 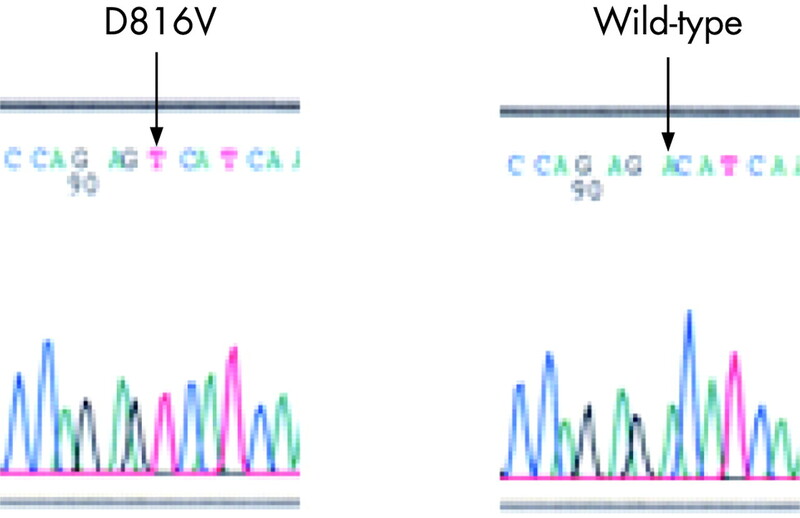 As shown in fig 2, the D816V mutation carried on plasmid JS1, constructed to contain the D816V mutation, was easily detected on an agarose gel, while wild-type c-kit carried on plasmid JS2 did not amplify D816V. DNA sequencing (not shown) confirmed JS1 to contain D816V and JS2 to contain wild-type c-kit exon 17. Figure 1 PCR strategy for detection of the D816V mutation. Genomic DNA isolated from paraffin-embedded tissue samples is subjected to PCR amplification using a two-tube format. Tube 1 amplifies a portion of c-kit exon 17 using a forward primer that spans intron 16/exon 17 and a reverse primer specific for exon 17. The amplification using this primer set occurs regardless of mutation status and results in an 184 bp amplicon. Tube 2 amplifies c-kit exon 17 using a mutant allele-specific forward primer and the same reverse primer as in the control reaction. The mutant allele-specific primer contains a mutation 3 bp from the 3′ end (illustrated by inverted v) and the 3′ end of the primer was designed to match the mutant allele. Because the 3′ end of the primer matches the mutant allele, the amplicon is formed resulting in a 90 bp product. On the other hand, the 3′ mismatch between the primer and template in a wild-type sample will inhibit extension, thus no product is formed. Figure 2 Detection of the D816V mutation by allele-specific PCR. Allele-specific PCR was used to detect the D816V mutation carried by a plasmid. The plasmid carrying the D816V mutation (JS1) and wild-type c-kit (JS2) was constructed as described in Methods. Allele-specific PCR requires two amplifications. The first PCR amplifies c-kit exon 17 sequences whether the mutation is present or not, and the second PCR amplifies mutant sequences only. The amplification reactions were analysed by ethidium-bromide-stained agarose gel electrophoresis under ultraviolet light. The lanes below the D816V-induced plasmid JS-1 illustrate the 184 bp control amplicon band and 90 bp D816V allele-specific amplicon band. 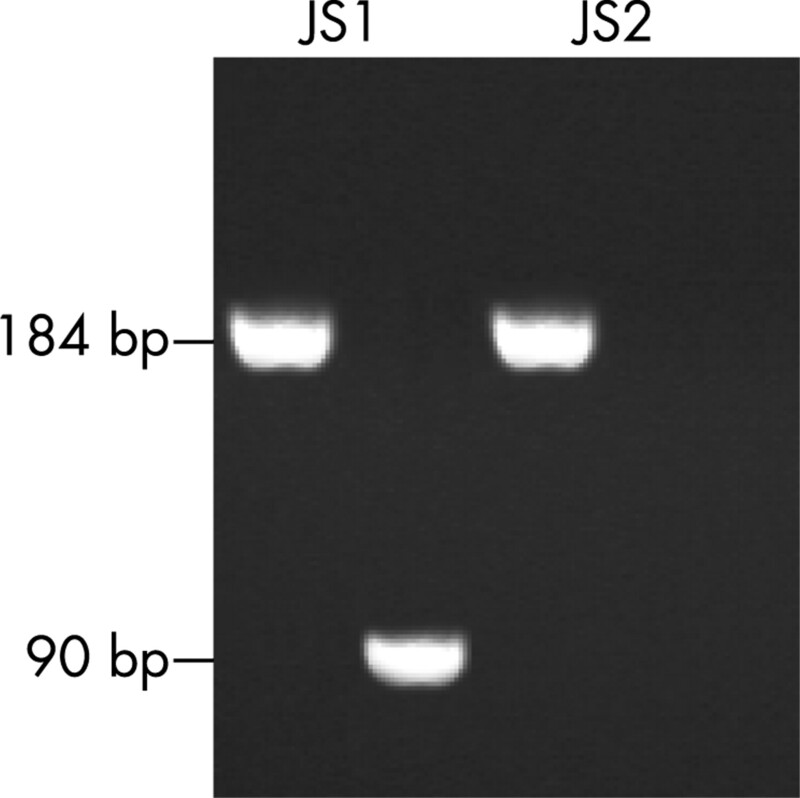 The lanes below the wild-type plasmid JS-2 illustrate the 184 bp control amplicon band but not the 90 bp D816V allele-specific amplicon band. To determine the clinical utility of the D816V AS-PCR, we evaluated FFPE bone marrow core9 and clot5 samples of 13 patients diagnosed with SM using World Health Organization criteria, and a FFPE bone marrow core of one patient diagnosed with D816V-positive seminoma, which had been confirmed by DNA sequencing of PCR-amplified tumour cells enriched by laser capture microdissection. Eleven of the 12 patients with SM (fig 3, 1–12) and the patient with D816V-positive seminoma (fig 3, Sem) tested positive for the D816V mutation using our assay. We subsequently analysed clot and core samples from a new case of SM for the D816V mutation. Figure 4A shows scattered mast cells in this H&E-stained trephine section. Figure 4B shows immunohistochemical staining of a trephine section using CD117 (KIT). Figure 4C illustrates the results of AS-PCR performed on DNA isolated from a clot (left) and core (right) sections. As indicated by the ethidium-bromide-stained gel, this patient’s clot and core are positive for the D816V mutation. We also analysed 35 marrow samples from patients without SM and none showed the presence of the D816V mutation (not shown). Figure 3 Detection of the D816V mutation in patients diagnosed with systemic mastocytosis (SM) and D816V-positive seminoma. Patients with SM underwent bone marrow biopsies. Ethidium-bromide-stained agarose gel analysis of PCR amplification of the c-kit control and D816V in patients diagnosed with SM and D816V-positive seminoma. The 184 bp control amplicon is visible for all samples while the 90 bp allele-specific amplicon is visible for all patients, except sample 2. Figure 4 Bone marrow from a patient with systemic mastocytosis (SM). A patient with SM underwent bone marrow biopsy. (A) H&E-stained section showing mast cells admixed with normal marrow elements. (B) Immunohistochemical staining of the biopsy with CD117 (KIT). Several aggregates of cells are KIT positive, indicating the presence of mast cells. (C) Genomic DNA was isolated from bone marrow clot and core trephine sections. The DNA was analysed by D816V allele-specific PCR. The presence of the D816V mutation is indicated by the appearance of the 90 bp fragment in the patient’s clot and core biopsies. The first lane in each series represents the results of PCR with control primers designed only to insure the presence of c-kit exon 17 sequences. When c-kit exon 17 sequences are present in the sample analysed, the amplification yields a 184 bp amplicon as indicated. The second two lanes in each series represent PCR with the specific D816V primers. When the mutation is present in the sample tested, a 90 bp amplicon is observed as indicated. In order to confirm the presence of the D816V mutation, all positive samples were subjected to DNA sequencing. All samples were below the detectable limits of sequencing. We selected one case of SM with the highest relative expression of D816V (fig 3, sample 11) and amplified c-kit using primer set 4. PCR amplicon was subsequently digested with NotI and AscI, cloned in pENTR, and colonies screened for the presence of the D816V mutation by DNA sequencing of mini-prepped plasmid DNA. One colony in 20 was shown by DNA sequencing to carry the D816V mutation (see fig 5). Figure 5 DNA sequencing confirmation of the D816V mutation in a cloned fragment of c-kit from a D816V-positive patient sample. A PCR amplicon from patient 11 (fig 3) was cloned and colonies screened, as described in Methods. Colonies were screened for the D816V mutation by DNA sequencing: 1/20 colonies was shown to carry the D816V mutation (left) and 19/20 were shown to be wild-type (right). 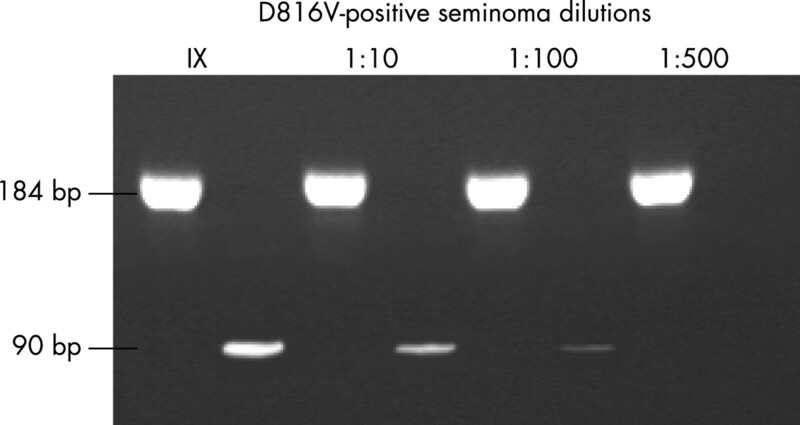 To determine the sensitivity of the allele-specific D816V mutation assay, genomic DNA from D816V-positive seminoma (fig 3, Sem) was subjected to serial dilution in genomic DNA from a D816V-negative patient sample and analysed. As shown in fig 6, the D816V mutation is detected even when making up only one part in 100. Figure 6 Sensitivity of allele-specific PCR. To determine the sensitivity of the D816V allele-specific PCR, genomic DNA from the D816V-positive seminoma sample was serially diluted in wild-type genomic DNA and subjected to PCR amplification of c-kit using our assay. The D816V mutation was detectable at a dilution of 1:100, corresponding to roughly 0.3% tumour cells. The D816V mutation in is one of the minor criteria for diagnosis of systemic mastocytosis and represents a potential drug target. Our allele-specific PCR assay provides a sensitive, specific and reproducible format to detect the D816V mutation. In this report we describe an AS-PCR approach for the detection of the D816V mutation in the c-kit gene. This mutation is found in >80% of cases of SM and represents a potential drug target.3 19 21 Because most of the lesions in mastocytosis consists of focal aggregates of mast cells admixed with non-neoplastic cellular elements, detection of the mutation in clinical samples by technologies such as DNA sequencing and dHPLC, are hampered by insufficient sensitivity.23 Strategies including PNA mediated-enrichment of the D816V mutant allele have been described24 but require expensive probes and titration of PNA for each patient sample. Other studies have used utilised PCR amplification followed by restriction enzyme digestion to enrich for the D816V mutant allele,16 25 but these studies required restriction enzymes and overnight incubations, which significantly add to testing costs. A recent report has also described the use of modified oligonucleotides to enrich for the mutant allele, further adding to testing costs.23 Here, we describe a simple AS-PCR assay designed to detect the D816V mutation in DNA from FFPE tissues. Our AS-PCR is based upon a forward primer being complementary to the mutant sequence. The D816V mutation is the result of an A-to-T transversion. Therefore, the forward primer to detect the mutant sequence was designed with a T at the 3′ end rather than the wild-type A. To prevent cross-reaction with the wild-type sequence, the third base from the 3′ end was altered from an A to a C. This modification eliminates cross-reaction with the wild-type allele and improves specificity. The use of additional mutations in primers has been described in assays to detect mutant k-ras,26 p5326 and Jak2.27 Thus PCR with this mutant forward primer will only result in product formation if the mutant sequence is present in the sample tested. After PCR, the products are easily detected by simple agarose gel electrophoresis and the method should be applicable to most clinical laboratory settings. We found that our AS-PCR is capable of detecting the D816V mutation even when the mutation is present at <1% tumour cells. This sensitivity is greater than that achieved by DNA sequencing and dHPLC. While this sensitivity is similar to that using modified oligonucleotides,23 using unmodified oligonucleotides will contribute to reduced testing costs. We employed a two-tube reaction format in order to increase sensitivity. We found that when combining the forward and allele-specific primers with the reverse primer and amplifying DNA, the forward primer suppressed the formation of the mutant product, even at a 10-fold excess of mutant primer (not shown). While a single-tube format would be more desirable than a two-tube format for AS-PCR, we found that amplifying a patient sample in duplicate for the mutant allele decreased the likelihood that template would be omitted from the amplification tubes. In order to confirm the D816V mutation in a patient sample that was D816V-positive using our assay, we utilised a cloning strategy followed by DNA sequencing of colonies. Because the allele-specific primer introduces the mutation into the amplified product, it is necessary to take additional steps to showing the test is specific. Furthermore, all D816V-positive patient samples were shown by direct DNA sequencing to be wild-type. Consequently, we subjected the patient sample with the highest relative expression of D816V (fig 3, sample 11) to cloning into the pENTR vector and screening colonies. Because the patient DNA was derived from paraffin, it was necessary to amplify as small a c-kit fragment as possible. We attempted other sequencing-based and restriction-enzyme-based strategies to confirm the D816V mutation, but all suffered from low sensitivity. Importantly, amplicons from all D816V-positive samples were subjected to direct DNA sequencing analysis and all showed only wild-type sequence. This further illustrates the necessity to selectively amplify the mutant allele for adequate sensitivity. In conclusion, we have developed an AS-PCR assay for the detection of the D816V mutation in SM. Although our assay is highly sensitive and specific for D816V, other alterations at KIT amino acid residues 816 and 820, as well as a juxtamembrane mutation at amino acid residue 560, which have been described in patients with mast cell disease,28 will not be detected. However, because the D816V is the most common mutation, and the presence of this mutation is one of the criteria for diagnosing mast cell disease, our allele-specific test will still prove useful in the evaluation of the majority of patients with mastocytosis.
. Classification and diagnosis of mastocytosis: current status. J Invest Dermatol 1991;96:2S–4S.
. Activating and dominant inactivating c-KIT catalytic domain mutations in distinct clinical forms of human mastocytosis, Proc Natl Acad Sci U S A 1999;96:1609–14.
. Systemic mastocytosis: bone marrow pathology, classification, and current therapies. Acta Haematol 2005;114:41–51.
. Regulation of mast cell development. Chem Immunol Allergy 2005;87:1–21.
. Lineage-specific signaling in melanocytes. C-kit stimulation recruits p300/CBP to microphthalmia. J Biol Chem 1998;273:17983–6.
. Identification of mutations in the coding sequence of the proto-oncogene c-kit in a human mast cell leukemia cell line causing ligand-independent activation of c-kit product. J Clin Invest 1993;92:1736–44.
. Modulation of Kit/stem cell factor receptor-induced signaling by protein kinase C. J Biol Chem 1994;269:21793–802.
. Early signaling pathways activated by c-Kit in hematopoietic cells. Int J Biochem Cell Biol 1999;31:1053–74.
. Structure and regulation of Kit protein-tyrosine kinase – the stem cell factor receptor. Biochem Biophys Res Commun 2005;338:1307–15.
. KIT (CD117): a review on expression in normal and neoplastic tissues, and mutations and their clinicopathologic correlation. Appl Immunohistochem Mol Morphol 2005;13:205–20.
. KIT mutations are common in testicular seminomas. Am J Pathol 2004;164:305–13.
. BRAF and c-kit gene copy number in mutation-positive malignant melanoma. Hum Pathol 2006;37:520–7.
. KIT exon 8 mutations associated with core-binding factor (CBF)-acute myeloid leukemia (AML) cause hyperactivation of the receptor in response to stem cell factor. Blood 2005;105:3319–21.
. Analysis of the surface expression of c-kit and occurrence of the c-kit Asp816Val activating mutation in T cells, B cells, and myelomonocytic cells in patients with mastocytosis. Exp Hematol 2000;28:140–7.
. Identification of activating c-kit mutations in adult-, but not in childhood-onset indolent mastocytosis: a possible explanation for divergent clinical behavior. J Invest Dermatol 1998;111:1227–31.
. Novel approaches in the treatment of systemic mastocytosis. Cancer 2006;107:1429–39.
. Juxtamembrane mutant V560GKit is more sensitive to Imatinib (STI571) compared with wild-type c-kit whereas the kinase domain mutant D816VKit is resistant. Mol Cancer Ther 2002;1:1115–24.
. The c-KIT mutation causing human mastocytosis is resistant to STI571 and other KIT kinase inhibitors; kinases with enzymatic site mutations show different inhibitor sensitivity profiles than wild-type kinases and those with regulatory-type mutations. Blood 2002;99:1741–4.
. KIT mutations in mastocytosis and their potential as therapeutic targets. Immunol Allergy Clin North Am 2006;26:575–92.
. Dasatinib (BMS-354825), a dual SRC/ABL kinase inhibitor, inhibits the kinase activity of wild-type, juxtamembrane, and activation loop mutant KIT isoforms associated with human malignancies. Cancer Res 2006;66:473–81.
. Dasatinib (BMS-354825) inhibits KITD816V, an imatinib-resistant activating mutation that triggers neoplastic growth in most patients with systemic mastocytosis. Blood 2006;108:286–91.
. Allele-specific polymerase chain reaction for the imatinib-resistant KIT D816V and D816F mutations in mastocytosis and acute myelogenous leukaemia. J Mol Diagn 2006;8:604–12.
. One-step detection of c-kit point mutations using peptide nucleic acid-mediated polymerase chain reaction clamping and hybridization probes. Am J Pathol 2003;162:737–46.
. Sensitive detection of KIT D816V in patients with mastocytosis. Clin Chem 2006;52:2250–7.
. Analysis of the allele-specific PCR method for the detection of neoplastic disease. Diagn Mol Pathol 1997;6:49–57.
. JAK2 V617F in myeloid disorders: molecular diagnostic techniques and their clinical utility: a paper from the 2005 William Beaumont Hospital Symposium on Molecular Pathology. J Mol Diagn 2006;8:397–411, quiz 526.
. Activating mutations of the c-kit proto-oncogene in a human mast cell leukemia cell line. Leukemia 1994;8:S18–22.